My Snow White Witch Skeleton Necklace is for all you fabulous gothic princesses, corpse brides, and snow queens out there! 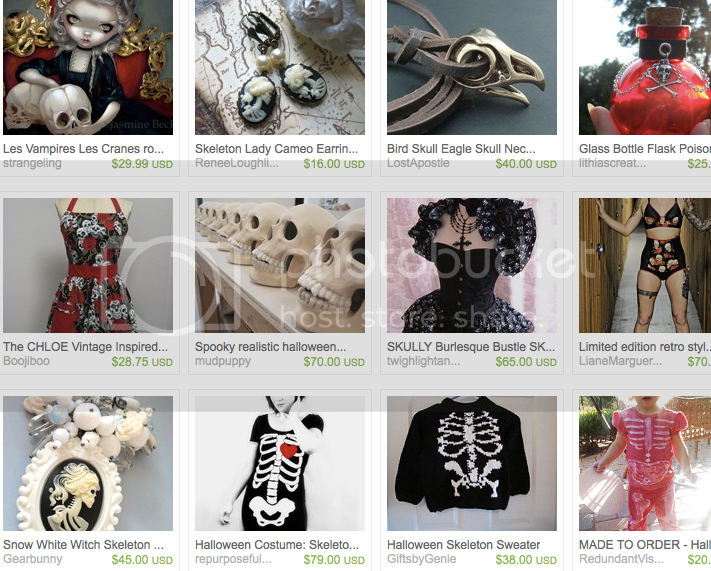 It’s been featured in a new treasury, It’s a Skeletal Thing. This treasury is genius. If I could I would buy everything here! Click to see full. In an effort to mix up my artistic repertoire I’ve become obsessed with making cha cha jewelry. Nope, I’m not talking about the Cuban dance – although I bet those dancers would look fierce wearing one of these. What is cha cha? It refers to a wearable piece with fringes and clusters of charms, beads, and other goodies. As a designer, it’s so much fun to play with different combinations. What colors will play off each other? What kind of textures, colors and materials can I combine harmoniously? These works of art swing and jangle, everchanging with the wearer’s movements. I love how they reveal different surprises according to how the charms settle. Many pieces that I’ve seen in this style tend to be cheery, sweet and whimsical. But of course, I like to put a dark spin on mine! Also, if you have leftover orphan beads, cha cha jewelry is a great way to use them up! Here’s some of my work. 1 – 2: In 2008 I first experimented with a different style for me, resulting in the Radioactive Riot bracelet. Several of the charms and shaped beads are handmade by me, including the syringe, pills, and star. I also used a bunch of vintage plastic and glass beads I had lying around. 3 – 8: Drawn back to cha cha a couple of years later, the Death and Bubblegum collection features pops of color topping creepy skeleton maiden cameos. So far I’ve done Black Lung, Blue Baby, Noxious Green, Barbie Pink, Red Queen, and Snow White Witch. What color next? Hmm, maybe a nice gray or purple. A few of these are still available at www.etsy.com/shop/gearbunny. 9 – 10: My newest cha cha bracelet is inspired by that classic fairytale, Alice in Wonderland. However, things seem amiss there lately. At first glance one sees candy, leaves and flowers. But what’s that lurking under the petals… venomous spiders? Arsenic capsules? Poisonous mushrooms? Maybe Alice isn’t in Wonderland, anymore. It’s really simple to make your own cha cha bracelet. Begin with a bracelet-length chain and clasp – create it yourself or purchase one premade. 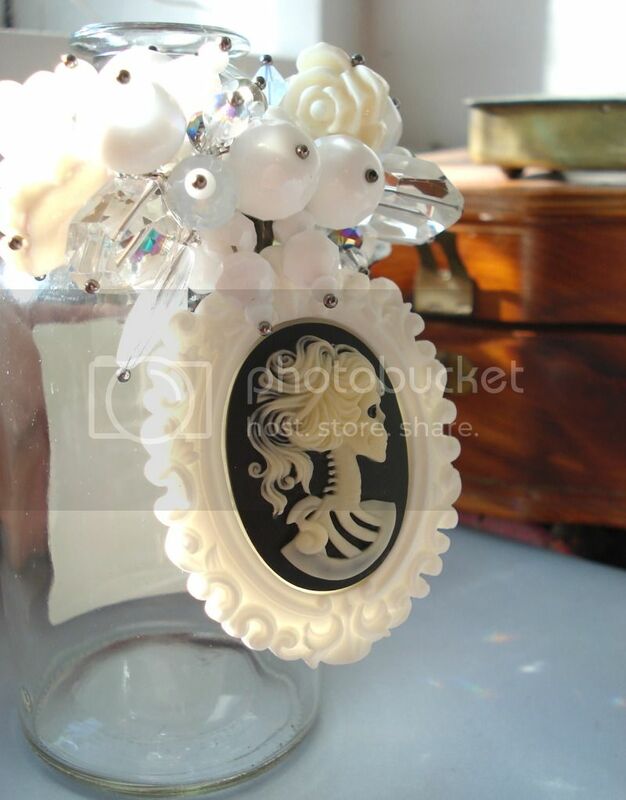 Using pliers, attach headpins and beads or charms of your choice. It can be as minimal or lush as you like. Karin Dreijer Andersson is the genius behind the Knife and Fever Ray, two of my favorite artists. It just so happens that her makeup is pretty interesting, too. 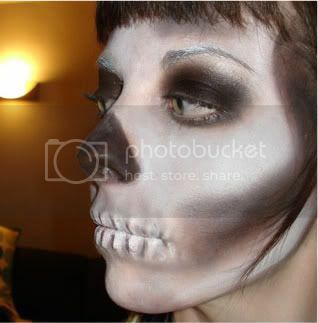 Do these give you any ideas for Halloween facepaint?